This month I’m in conversation with travel consultant and writer Sally Shalam. BIO: Fomer London Evening Standard travel editor and Guardian hotel critic, Sally Shalam is a writer, speaker and consultant with a love of the small and independent in Britain. She covers the hip, the new and the unsung for the national press, not least as a freelance contributing editor at Conde Nast Traveller. In an ideal world she’d combine working behind a shop counter or the bar of a community pub with writing and a renovation project. WHERE IS HOME FOR YOU? Somerset. Or wherever I happen to be … which is probably just as well. WHAT DO YOU LOVE MOST ABOUT YOUR NEIGHBOURHOOD? Space, plenty of space, which makes people more relaxed, kind and open. ANY LOCAL GEMS? The gardens at Stourhead are sheer bliss in every season. I love The Sheppey Inn on the Somerset Levels for food and sheer whackiness. The beauty and wildness of the Mendip Hills is pretty unsung. WHERE ARE YOUR FAVOURITE PLACES TO EAT IN THE UK? I love The Ethicurean just outside Bristol for vegetarian innovation in a lovely, tatty conservatory. Windlestraw, a guest house in the Scottish Borders was one of last year’s great foodie discoveries, while I was on the road for HertzUK. Beautiful ingredients served with flair and simplicity in beautiful surroundings. On the same project, I stopped at Wright’s Food Emporium in Carmarthenshire, which is a casual favourite, en route for St David’s where I had a stunning meal at Blas restaurant at Twr y Felin Hotel. WHERE WOULD YOU CHOOSE TO EAT YOUR LAST SUPPER AND WHAT WOULD YOU ORDER? Probably falafel, with a vat of tahina, on a warm beach. WHICH WAS YOUR BEST EVER UK HOTEL/ACCOMMODATION AND WHAT MADE IT SPECIAL? There is no best ever. Different places are memorable for different things. From a simple Scottish croft B&B where a friend and I stayed in bunk beds to the grandiosity of Skibo Castle at Dornoch, from the luxury of just-opened Heckfield Place to the charm of tiny Geaglum cottage in Fermanagh. What I really love, and the Guardian years were great for this, is a small B&B with an eccentric owner or a little hut somewhere – Out of the Valley on Dartmoor is great, I’d go back there anytime. WHICH UK HOTEL/ACCOMMODATION IS ON YOUR LUST LIST? 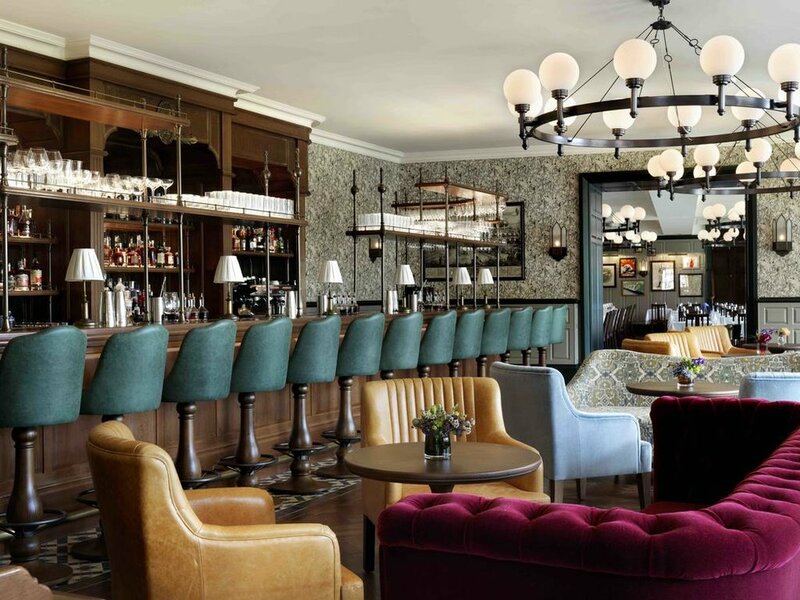 I’d like to see what architect John Simpson and designer Martin Brudnizki have done at the newly revamped University Arms in Cambridge which reopened in August after a two-year renovation. WHICH WAS YOUR BEST EVER EUROPEAN HOTEL/ACCOMMODATION AND WHAT MADE IT SPECIAL? La Bastide de Marie, near Menèrbes is oh so special. Part of Maisons & Hotels Sibuet, a group begun by visionary hotelier, Jocelyne Sibuet. She was creating her own beauty products way before anyone else, has an incredible eye for design, and is a truly ground-breaking woman. Just looking at the company’s website is a bit like going on holiday. WHICH EUROPEAN HOTEL/ACCOMMODATION IS ON YOUR LUST LIST? Ett Hem in Stockholm because designer Ben Thompson who has recently completed Heckfield Place in Hampshire (which I’m knocked out by, and have written about for Conde Nast Traveller and The English Home) worked on this, also. BEST EVER AIR BNB EXPERIENCE? I’ve never stayed in an AirBnB. Yet. I’ve stayed in squillions of backpacker beach shacks, shepherd huts, showmen’s wagons and railway carriages before AirBnB was a twinkle in anyone’s eye, though. All lovely. A SPECIAL TRAVEL MEMORY? I spent an amazing time on a Sri Lankan yoga retreat once,Ulpotha. No electricity, an open-sided mud hut with a mozzie net, vegetarian food sitting in a circle in a communal meeting pavilion, and parties with lots of drumming. My personal preference is for places with less rather than more. Although I write about Britain, the overseas places I love are Colombo in Sri Lanka and the southern coast, the Negev desert, Greek islands and Goa. I like heat. I firmly believe everywhere is special in some way – although I expressed this sentiment in the early days on Twitter and Hardeep Singh Kohli instantly Tweeted back that I clearly hadn’t been to such-and-such town in Scotland (I can’t quite recall where ... ). WHAT’S IN YOUR HAND LUGGAGE? If I’m flying, then everything I need for a day or so if my hold suitcase is lost. Flipflops, clean underwear, swimming things, and a rolled-up dress for evening. I’ve learned the hard way. I rarely fly though, so it’s almost always just hand-luggage. I travel light. Friends laugh at me and say I always turn up with a bag the size of a postage stamp. WHAT ARE YOU CURRENTLY READING ON YOUR TRAVELS? I never have time to read when I’m working. I’m either driving or rushing about taking notes. Most recently I’ve read The Long Silence, by my friend, the crime writer Gerard O’Donovan. That was at home, though. WHAT ARE YOU CURRENTLY LISTENING TO ON YOUR TRAVELS? In the car? Loud rock. WHAT IS THE BEST SOUVENIR YOU HAVE BROUGHT HOME FROM A TRIP? A few things. Rugs and a bowler hat from Bolivia, papier-mache balancing dolls from India (those not only survived carriage in my backpack but then lasted for years back here), Indian silver candlesticks from my last trip to Goa, and I always bring back sumac, cardamom and za’atar from Tel Aviv. The place where I really wanted to fill a shipping container was Colombo. Here, in the UK, I hunt for something to put on the table when I get home (because the cupboard is always bare). Often it’s a previously untried regional cheese (I’m still not over the fantastic slab of Gorwydd Caerphilly I left in a hotel fridge in Llandudno), but I’ve brought home wonderful chard from Ashburton, and oatcakes from Derbyshire – they’re like ironed crumpets, thin and delicious. I once interviewed by phone the late, great writer, Eric Newby. He patiently and entertainingly answered all my questions, then politely excused himself as he said he had some Indian caviar, brought back that very day, waiting to be eaten. I think that’s my favourite souvenir tale of all.